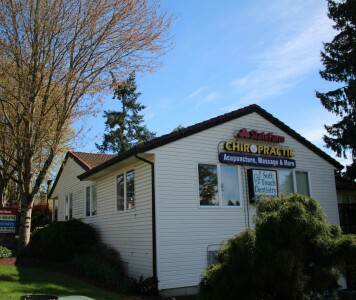 Since 2010, the mission of EmPOWERed Health has been to provide quality chiropractic care to the residents of Clackamas and Happy Valley. With full body adjusting and a variety of other techniques, we help you get out of pain, so you can thrive. Just as musicians in an orchestra work together to produce beautiful sounds, our team of chiropractors, massage therapists, and an acupuncturist work harmoniously to get you results. Each member plays an essential role in helping patients experience relief and wellness. If you’ve been to doctors’ offices before where you felt like a number, you should know that we are different. Our thorough practitioners take the time to get to know you and to determine what is going on with your health. Because no two patients are precisely alike, we then will make a unique care plan to help you heal and get on the path to pain-free, healthier living and a higher quality of life. In our clinic’s window is a sticker that says, “Pain is not a lifestyle.” We agree. You should never resign yourself to living a life in pain. Whether you have been battling back pain for years or have neck pain due to an auto accident, we want to help you. Once you are out of pain, we hope to get you to a state of wellness. One of the most important steps to getting you back to your normal life as fast as possible and to prevent new injuries is to incorporate small changes or tweaks into your daily routine. It might be changing how you sit at your computer, how you exercise or how you do work around the house. We will help you by giving you easy changes or exercises that you can do anywhere, so that you will get the most out of your care. At the practice, we always try to go the extra mile for our patients. One of the ways we do that is by educating them about actions they can take at home that are easy to incorporate into their daily routine. These small changes or tweaks can help you get out of pain and be more efficient. Discover for yourself how our team approach to care can help enhance your quality of life. Contact us today to book an appointment.